Fishing deep northern lakes for smallmouth can present the proverbial feast-or-famine scenario. Erie, St. Clair, Ontario, Champlain; these all-stars, along with many other brown fish favs, offer vast ranges of productive bottom structure. It all looks "fishy," but quickly comes that ageless question: "Where to start?" No doubt, a lot of fishing often comes down to a lot of looking, and while the shallow migration of spawning season puts lots of fish in more predictable locations, the rest of the year finds them scattered across the lake's deeper structure. Investing sufficient search time is assumed, but the ill-prepared can float for hours and produce little or nothing. Fact is, every boulder and break may look like it could hold a herd of hefty smallmouth, but the real gold mines are hardly random. There's usually a clear reason why certain spots produce best. On a past outing on Lake Ontario, EverStart Northern Division pro Joe Lucarelli's graph showed a large boulder rising several feet off the bottom. Pointing to a handful of heavy marks, he noted his preference for quality over quantity. "I want to see two to three good hooks (on the sonar), because the bigger the fish, the more color you have in the hook," Lucarelli said. "If you see two or three hooks, there's obviously more fish down there, you just didn't see them when you drove over them. But if you see a ton of fish on the screen, there's only so much bait for these fish to feed on. "It's like deer hunting where you can only have a certain amount of deer in a square mile because there's only so much habitat for those deer to feed on before they run out of food. It's the same thing with fish. I'd rather have a couple big smallmouth consuming bait than have 25 2 1/2-pounders mixing it up amongst themselves." 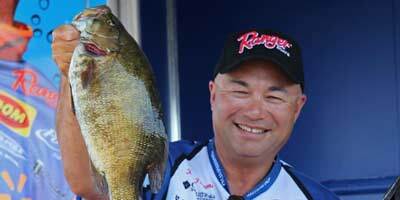 Canadian fishing legend and TV host, Bob Izumi, knows that with countless acres of similar bottom, big smallmouth gravitate toward the spots of subtle differences. Izumi calls them "hooks" and these sharp turns in a lake's rocky bottom can lead him to smallmouth bonanzas. "There are so many break lines out there that can hold fish, but it's important to find the broken rock on the graph," Izumi said. "I rely on my Lowrance graph 100 percent. I'm constantly looking at the graph. If I mark a fish - even one or two - I sit on them and try to catch them for five or 10 minutes and then I move around with the electric motor. "It's really like sight fishing in shallow water, only you're sight fishing with your electronics. You just mark them and work them. They're not all biters down there, but when I'd start marking balls of baitfish, I'd stick in the area. If you mark a couple of hooks near a school of baitfish, it's usually a done deal." Lucarelli has found some of his best smallmouth action on isolated rocks far from the more obvious spots of larger scope. Idling the rocky outskirts of an offshore island, or a large reef system, he'll monitor his Humminbird 998c with his beams set at 80 feet on either side. "You can't beat that side-imaging when it comes to finding fish on the Great Lakes," Lucarelli said. "These lakes are just so vast, it just saves you so much time. If you can determine if the fish are on rocks or other types of things, you can duplicate that over and over again." Izumi suggests looking beyond the obvious and fish for the heavier smallies that many anglers fail to locate. Noting that he has pulled the rare 6-pounder from a wad of 2's and 3's, Izumi said he typically expects to find his better smallies segregated from the lesser fish. "Those bigger fish sometimes tend to be off the edges," he said. "What I find is that if you're getting numbers in 20-24 feet of water, drop down into 30-32 feet or even deeper because those bigger fish tend to sit off the big schools." N.Y. pro Lawrence Mazur takes that concept a step farther. When Mazur won the 2011 EverStart Northern Division tournament on Lake Erie he targeted an area of chunk rock and boulders in 52-70 feet of water. The late-August event found air and water temperatures remaining warm, so Mazur worked the outer edge of targetable structure. "It's the last piece of structure before it gets out into really deep water," he said. "As you get further down the lake, you get into 130 feet of water and there's not that much structure out there. The bait's not going to go out into that deep water and cruise around, so it just hangs out there. The smallmouth just follow that bait and hang in that structure." When Lucarelli dropped a tube to a cluster of rocks in about 24 feet, it didn't take long for a frown of consternation to indicate our forthcoming departure. It was just the lack of smallmouth bites, but also the absence of Goby activity. This invasive species has expanded widely throughout many northern lakes and they like to nibble at the fringes of tubes meant for bass. "I'm just not getting the goby bites here - that's gotta mean something," he said. "Those (smallmouth) are not out on the rocks because they think it's cool. They're there because they want to eat. So if the bait's not there, then the fish aren't going to be there. "There's nothing better than throwing a dropshot and you feel the tap, tap, tap, tap, tap, tap and all of a sudden the tapping stops and then you have that one (big) bite and the rod just loads up. That's the gobies drawing attention to your bait, a smallmouth coming over to your bait, the goby getting out of there because he doesn't want to get smoked and then you catching the smallmouth." Once Izumi locates his fish, he won't risk losing the opportunity. Like most, he relies primarily on a dropshot for his deep smallmouth pursuits, but Izumi quickly ushers his rig into the strike zone with a 5/8- to 1/2-ounce tungsten weight. The advantage is twofold. First, heavy dropshots punch through the often rough water to reach bottom in short order, while the beefy weight stabilizes the rig to help maintain the essential vertical presentation when windy conditions keep the boat bouncing. "It's really important to drop on them and not have a light weight that slowly falls," Izumi said. "You want something that'll get down there and almost hit them on the head."